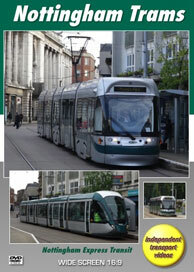 Trams returned to the streets of Nottingham in 2004 after an absence of some 68 years. The current fleet are operated by Tramlink Nottingham with the brand name of Nottingham Express Transit, but the initials NET are used as the fleet logo on the vehicles, publicity and infrastructure. At the time of filming the fleet consisted of fifteen Bombardier Incentro AT6/5 trams numbered 201 to 215 and twenty-two Citadis 302 trams numbered 216 to 237. The numbering system carries on from the last batch of trams delivered in 1926 numbered 181 to 200. The initial route on the new system, that opened in 2004, runs from the city centre to Hucknall with a spur running from Highbury Vale to Phoenix Park. This was known as Phase One. Phase Two was opened on the 25th August 2015. This is infact two lines, one being from Nottingham Station to Clifton South, the other being from Nottingham Station to Toton Lane. Both new termini as with the existing termini incorporate large Park & Ride sites. This DVD programme was filmed over four visits to the city from 2014 to 2016 and is in two parts. The first covers Phase One, our first visit being in June 2014. Starting with a ride on Bombardier tram 209 from Phoenix Park to Nottingham Station, which at the time was the end of the line. We then take up positions at some seven locations along the route within the city centre, including Middle Hill, Fletcher Gate, Victoria Street and Goldsmith Street. At Old Market Square we see brand new Alstom Citadis tram number 223 on driver familiarisation duties. Also look out for Bombardier tram 211 on driver training duties in an all over advertisement for Phase Two and advertising the new Alstom trams! Filming continues at The Forest and at Highbury Vale. From here we join tram 209 again for the short journey to Phoenix Park. Our second visit in 2014 was in October, where we board tram 217 and ride from Phoenix Park to Lace Market to film more action in the city centre. We join 217 again to visit the Nottingham Station stop and then continue filming in the city centre at various locations. Further footage is filmed at the Hucknall terminal. We then board tram 204 to Highbury Vale to see action at this busy junction before returning to Phoenix Park on board tram 208. Our third visit in April 2015 sees the new Karlsruhe Friendship Bridge at the new station stop prior to its official opening. We continue with further filming in the city centre and at The Forest stop. The second half of our programme shows Phase Two in its entirety. Filmed in September 2016, we begin with the Clifton line at the Nottingham Station stop and film the route from either the roadside or on board the trams. Locations include Meadows Way, Queens Walk, Wilford Bridge and Village, Clifton Centre and Clifton South terminal. The Toton Lane line is also covered in its entirety from Nottingham station, with locations including, NG2, Gregory Street, Queens Medical Centre, the University areas, Beeston Centre and Chilwell. We then ride to Toton Lane on tram 208. Our final location on this programme is the Wilkinson Street stop and junction, where we film the evening peak, which is adjacent to the tram depot. There is plenty of action to see as night falls and the first tram returns to the depot after a long and busy day! Whilst filming in Nottingham we found that the people of the city and the NET staff were very proud of their tram system. We would like to thank all the members of NET staff, drivers and inspectors that we came in contact with during our filming. Their help and information was most valuable and made our filming a most pleasurable experience.